You had me at Kimchee Quesadilla. The quality and number of foodtrucks in Vancouver is on a welcome rise. Unlike some other cities, the permits for these little havens is thankfully controlled. We were chatting with some Portland locals on the train last week. We were raving about their foodtrucks. There, many have taken up permanent residence in many of the downtown public parking lots. Whilst they generally agreed it was a good thing, they said that the quality isn't controlled enough and there are alot of random trucks going up without the same attitude to being a portable yet serious purveyor of good eats. I first read about the Coma truck in the freebie newspaper and the minute I read the menu, I was hooked. Korean Mexican fusion. Awesome. The first I heard of the idea was in San Francisco last year. A well known mexican place in the Mission started serving Bulgogi Burritos. A great idea just waiting for mass exploitation! I was even more thrilled to find out that they do a once a week visit to Fairview, woohoo! The chef in residence has been interviewed many times in the Globe, Metro and the Sun so I'll let you read there about their history. I'll just tell you that the food was awesome and well worth hauling over the Cambie and Broadway with an infant in tow. They have about half a dozen menu items and you have four choices of proteins for their Burrito. D had that and has had it twice and tried both the Pork and the Spicy Beef. The liked both quite alot but preferred the Beef. A nice mix of spicy Korean flavours and fresh ingredients. This a double whammy for Vancouver since a good burrito is hard to find. My favourite place is Budgies on Main. MMMMM, I digress. I ordered the Kimchee Quesadilla. 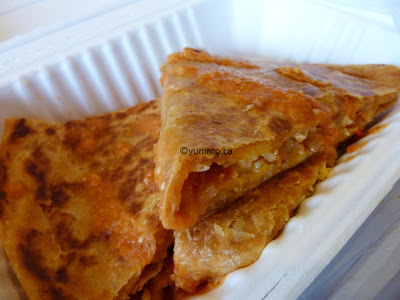 It is a nice large Tortilla filled with a mild melting Cheese and heaps of Kimchee, topped with a light spicy sauce. Wonderful, made to order and piping hot! I've had it twice in the last month. We then shared the Fried Seaweed Rolls. It is Bean Thread Noodle, like the ones used in Japchae, wrapped in Kim (aka Nori), battered and fried. They're served with a sweet, sort of honey like sauce. So yum. D didn't care for it but he doesn't care for random deep frying. I on the other hand could eat just about anything deep fried. They give you a generous 6 pieces. Both the quality and portion is heaps better than the equivalent dish I saw at the Richmond Night Market. The one thing I would love to know is what the heck the name means. I thought it might have something to do with the way you say thank you in Korean but dunno. They also have Bibimbap, a classic and a favourite! Regardless of their cryptic and sleepy monacher, they have a regular in me!